I’ll never forget the first taxi ride I took in Medellín, Colombia. As we approached the city, my driver stopped at a red light. In the lane next to us, another taxi driver sat waiting for the lights to change. Those two drivers—strangers to each other—began to talk. I don’t remember what they chatted about that day. All I remember is their friendly, easy manner… which, coming from Panama City, was refreshing. Panamanian taxi drivers, you must understand, use honking as their main form of communication. Traffic lights are their enemy. These Colombian guys didn’t show any signs of stress. They seemed content just doing their job—and courteous to all around them. Each time I’ve been back to Medellín, it’s been the same. And, it doesn’t stop with the taxi drivers. The people of Medellín are warm and welcoming… and quick to offer help to anybody—no matter how long you’ve been in town. 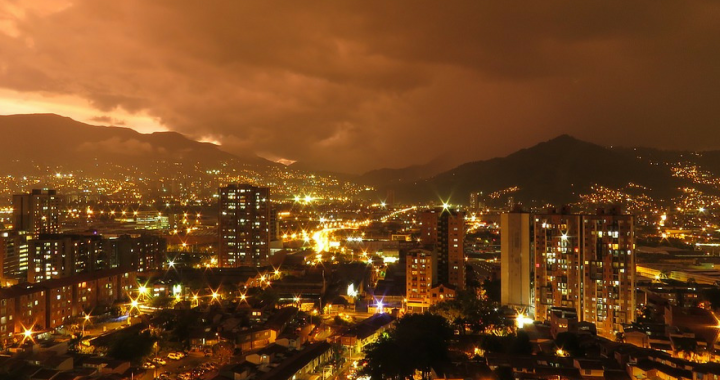 Allison, who was on the ground in Medellín’s Hotel San Fernando Plaza for our eighth annual Live and Invest in Colombia Conference, reports that the friendly vibe is alive and well… and continuing to draw in even more expats. Jeff and Heather Raheb, who shared their story with our crowd last week, are just one year into their new life in Medellín. It was at our Retire Overseas Conferencein Orlando some years ago that their interest in Colombia began. “I sat in on Rich Holman’s presentation on Colombia and came out all jazzed up and thinking ‘We’ve got to do this Medellín thing!’” Jeff told the crowd last week. But Heather decided to give it a go… and to do so in July when temperatures were unbearable back home in Florida. In Medellín that July, they found spring. And, they wanted more of it. While Jeff and Heather were exploring different parts of the city to see where they might live, they stayed at a hotel in Medellín’s Ciudad del Río neighborhood. One day, as they planned to check out Sabaneta—an area just outside the city—they asked the hotel staff if they had any suggestions for what to do out there. After a quick call, the girl gave Jeff and Heather her Aunt María’s number and instructed them to get in touch once they arrived in the neighborhood. The couple followed their orders. María met them in the square… walked them around town… had her husband pick all three of them up in his truck and drive around town some more… before taking them back for dinner at their family home… and finally delivering them to their hotel for the night. “Is this real?” the couple found themselves asking themselves again and again. Yes, it’s real. And typical of Medellín. If you weren’t on the ground last week to hear the expats tell their stories of how they came to Colombia and what it’s like to live here day by day… as well as all the practical information you need to make your move in this country of many options… you don’t have to miss out. You can access everything our experts discussed behind closed doors at the Hotel San Fernando Plaza through our Colombia Home Conference Kit. This week only, as we work to package all audio recordings and slideshows (plus a set of bonus reports) together, we’re offering more than 50% off the kit with our Special Pre-Release Discount Offer. Simply use your private Coupon Code CHCK20 when ordering to avail of your exclusive discount. This Pre-Release Discount Offer is available until Wednesday, June 13 only. Posted in Live And Invest Overseas Confidential and tagged friendly colombia, friendly medellin, medellin colombia, refreshing medellin, Valentine Fouche.